At the end of our stay at The Stable in Dunsany, we said our goodbyes to the Lydon's and were off to County Leitrim. Before we left on our trip to Ireland, I had phoned Phil O'Brien, Sean Clarke and John Reynolds looking for a place to stay. 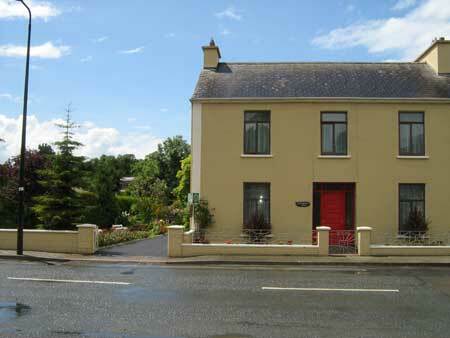 When we made our plans, we never expected that there would be a shortage of rooms available in Mohill. Little did we know that there were two weddings and an Irish football tournament, so space was very limited. John gave me three phone numbers to call. The first one had no vacancies, the second one never answered, but the third one had an answering machine so I left a message. A short time later, Tina Slevin, from Coolabawn House B & B, returned my call. She had a very charming telephone personality and she said she could put us up for every night except Friday, June 29th. We were very relieved that we had a place to stay. Our first stop in Mohill was at O'Brien's Tavern on Glebe Street. Phil wasn't sure that we would actually be making our trip because she knew that space was limited. She and Jim were glad to see us and welcomed us as usual. When we told Phil that we still needed a room for Friday night, she started thinking about it and told us not to worry. She told us if she couldn't find us a room, we could spend the night in one of their daughters' bedrooms, as one of them was away at the time. We got in our cute little yellow Fiat Panda and drove out to Rynn to see Teresa, John P., and Gerry Bohan. John P. wasn't around but Teresa and Gerry visited with us for a while. Gerry knew that we were coming because he had heard that we were looking for accommodations, but Teresa was surprised to see us. We left there and went to check into our room at Coolabawn House. Tina wasn't there at the time so her husband, Tim, showed us to our room. After a nap, we went out to Rynn, picked up Gerry and went back to O'Brien's Tavern for the evening. We learned that there were some big changes happening at Clarke's Hotel on Main Street. It would be a major expansion for Sean but would be worth it in the end. We made it an early night because of the jet lag and agreed to pick up Gerry on Friday, the next day, and go searching through graveyards again. When we awoke in the late morning, we met Tina and had a 'cuppa' tea with her. She was such a happy go lucky person, it was impossible not to like her. We will tell you more about the Slevins and Coolabawn House in the next story. Click here for the next story Coolabawn House.